(Nanowerk News) Ever since computers have been small enough to be fixtures on desks and laps, their central processing has functioned something like an atomic Etch A Sketch, with electromagnetic fields pushing data bits into place to encode data. Unfortunately, the same drawbacks and perils of the mechanical sketch board have been just as pervasive in computing: making a change often requires starting from the beginning, and dropping the device could wipe out the memory altogether. As computers continue to shrink--moving from desks and laps to hands and wrists--memory has to become smaller, stable and more energy conscious. A group of researchers from Drexel University's College of Engineering is trying to do just that with help from a new class of materials, whose magnetism can essentially be controlled by the flick of a switch. The team, led by Mitra Taheri, PhD, Hoeganaes associate professor in the College of Engineering and head of the Dynamic Characterization Group in the Department of Materials Science and Engineering, is searching for a deeper understanding of materials that are used in spintronic data storage. Spintronics, short for "spin transport electronics," is a field that seeks to harness the natural spin of electrons to control a material's magnetic properties. For an application like computing memory, in which magnetism is a key element, understanding and manipulating the power of spintronics could unlock many new possibilities. Current computer data storage takes one of two main forms: hard drives or random access memories (RAM). You can think of a hard drive kind of like a record or CD player, where data is stored on one piece of material--a hard disk--and accessed by a magnetic read head, which is the computer's equivalent of the record player's needle or the CD player's laser. RAM stores data by encoding it in binary patterns of electrical charges called bits. An external electric field nudges electrons into or out of capacitors to create the charge pattern and encode the data. To store data in either type of memory device we must apply an external magnetic or electric field--either to read or write the data bits. And generating these fields draws quite a bit of energy. In a desktop computer that might go unnoticed, but in a handheld device or a laptop, quality is based, in large part, on how long the battery lasts. Spintronic memory is an attractive alternative to hard drives and RAM because the material could essentially rewrite itself to store data. Eliminating the need for a large external magnetic field or a read head would make the device less power-intensive and more rugged because it has fewer moving parts. "It's the difference between a pre-whiteout typewriter and the first word processor," said Steven Spurgeon, PhD, an alumnus whose doctoral work contributed to the team's recently published research in Nature Communications ("Polarization screening-induced magnetic phase gradients at complex oxide interfaces"). "The old method required you to move a read head over a bit and apply a strong magnetic field, while the newer one lets you insert data anywhere on the fly. Spintronics could be an excellent, non-destructive alternative to current hard drive and RAM devices and one that saves a great deal of battery life." While spintronic materials have been used in sensors and as part of hard drive read heads since the early 2000s, they have only recently been explored for direct use in memories. Taheri's group is closely examining the physical principles behind spintronics at the atomic scale to look for materials that could be used in memory devices. "We're trying to develop a framework to understand how the many parameters--structure, chemistry, magnetism and electronic properties--are related to each other," said Taheri, who is the principle investigator on the research program, funded by the National Science Foundation and the Office of Naval Research. "We're peering into these properties at the atomic scale and probing them locally, in contrast to many previous studies. This is an important step toward more predictive and far-reaching use of spintronics." Theoretically, spintronic storage could encode data by tuning electron spins with help from a special, polarized electrical current running through the material. The binary pattern is then created by the "up" or "down" spin of the electrons, rather than their presence "in" or "out" of a capacitor. To better understand how this phenomenon occurs, the team took a closer look at structure, chemistry and magnetism in a layered thin film oxide material that has shown promise for use in spintronic data storage, synthesized by researchers at the University of Illinois--Urbana Champaign. 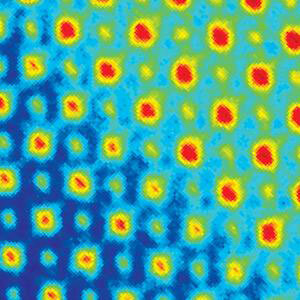 The researchers used advanced scanning transmission electron microscopy, electron energy loss spectroscopy and other high-resolution techniques to observe the material's behavior at the intersections of the layers, finding that parts of it are unevenly electrically polarized--or ferroelectric. "Our methodology revealed that polarization varies throughout the material--it is not uniform," said Spurgeon, who is now a postdoctoral research associate at Pacific Northwest National Laboratory. "This is quite significant for spintronic applications because it suggests how the magnetic properties of the material can be tuned locally. This discovery would not have been possible without our team's local characterization strategy." They also used quantum mechanical calculations to model and simulate different charge states in order to explain the behavior of the structures that they observed using microscopy. These models helped the team uncover the key links between the structure and chemistry of the material and its magnetic properties. "Electronic devices are continually shrinking." Taheri said. "Understanding these materials at the atomic scale will allow us to control their properties, reduce power consumption and increase storage densities. Our overarching goal is to engineer materials from the atomic scale all the way up to the macroscale in a predictable way. This work is a step toward that end."